Done, bound, and ready to go home. As ideas go, this is a pretty insane one. I've been routing my creativity off in a few different directions while stumped on how to proceed with Adam's wedding quilt (sigh, hang head in shame, lather, rinse, repeat) and this direction has been stranger than most. 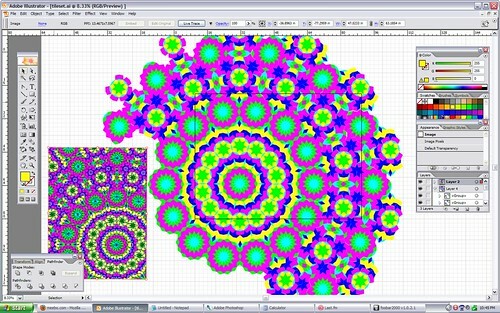 I've made no secret of my intention of doing a Penrose tiling quilt ('Pentatonic') later this year, and it has sent my brain in lots of new directions. 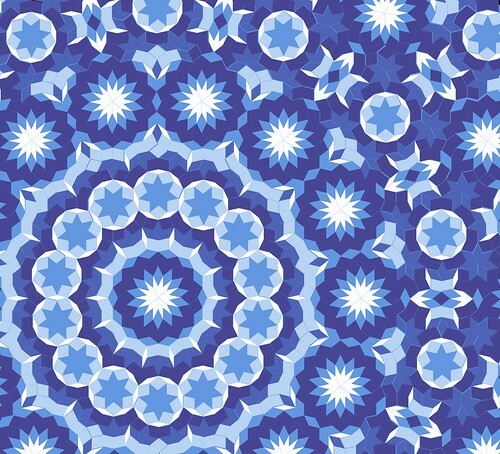 It's caused me to look hard at Islamic tiling patterns, which meant I encountered more aperiodic tilings, and started looking at patterns that weren't based on the fours, sixes, eights, and nines of standard quilting. 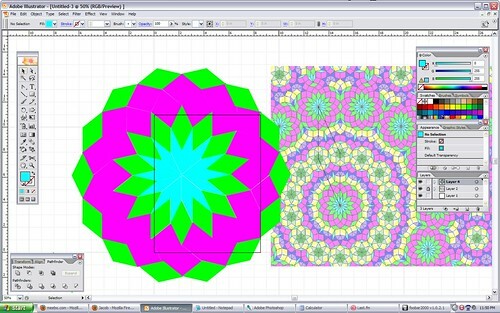 Then I found John Savard's page (http://quadibloc.com) and specifically his page on heptagonal tilings. Yep, sevens. My brain melted slightly when I tried to process the math; much of it is specialized and I am untrained. But there was an image, down at the bottom, an image that baked my brain and caused a flurry of emails. The tiny light blue rhombs are 14 per circle, so 360° / 14 == 25.714°. 154.286° for the other angle. The bright green rhombs have a point tucked between the two wide points of #1 -- those two wide points added together are 308.57°, which means the bright greens have angles of 51.429° and 128.571°. The magenta rhombs form 360° when combined with the skinny side of #1 (25.714°) and two fat sides of #2 (128.571 * 2 = 257.142°) so they must be 360° - 282.857° == 77.143° on on side, and 102.857° on the other. It took several false starts, and a frustrated email to seanb and Stephen, before Jacob supplied me with two small pieces of information I needed to start laying out the design. If 'pentatonic' doesn't kill me, this one might. To quote the JeffSpouse: "That's a fuckload of pieces, you know." Okay, this design? It is full of awesome. And also of math. 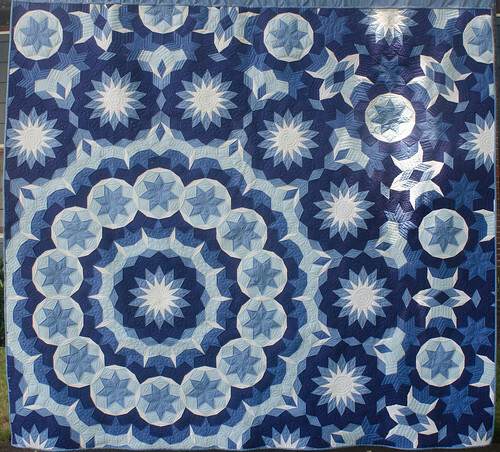 This is an amazing and beautiful pattern and I love the color palette. I love it. I can't wait till you have pictures of your progress. 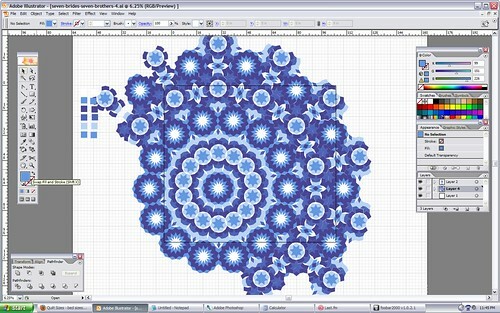 Maybe you can publish a pattern??? My very favorite patterns is stars of any kind. I'm right there with you. I can see the fabric for the quilt from where I'm sitting right now. Lots of things got put aside for a while after my husband had his accident, and heavily-technical sewing was one of them. I'm just now starting to ease myself back in -- he spent two months in the ICU followed by an extensive hospital and rehab-hospital stay. Not much has gotten done in that time, but I'm starting to find my 'new normal' as I refer to it. I'm here to give you an attaboy for working on this quilt. I love the fact that you have immersed yourself in something big and huge and one of those things that, when complete, you'll hang on your wall and admire for the rest of your life. You've got a fan!